Georgia is a country of ancient churches perched atop rugged valleys, a background of snow-capped peaks of the Caucasus Mountains and the picturesque shores and dark, deep waters of the Black Sea. 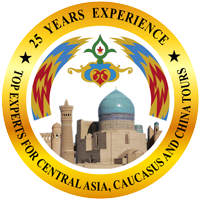 Its close proximity to Asia, the Middle East, and Europe has made it a cultural crossroads throughout history and the Silk Road brought travelers, scholars, and merchants here. Georgia is the setting for the Greek myths of both the Golden Fleece and Prometheus. The country itself was unified under one king in the 4th century B.C. and early on adopted Christianity as its state religion. Its capital city, Tbilisi, is a bustling, growing city, with museums, universities, theaters, galleries, and cafes. The heart of the city is still the Old Town, a charming mix of wooden houses, open-air balconies and winding streets. Mtshketa is the ancient capital and still an important historical and religious center, with UNESCO World Heritage Sites and fabulous examples of fortresses, monasteries and castles. Tourism is burgeoning here, from ski resorts at Gudauri to beaches in Batumi, and in countless traditional towns and ancient sites in between. Known as the birthplace of wine, with archaeological evidence dating back to the 6th century, Georgia grows hundreds of varieties of grapes in the Khalketi region and produces fine wines, brandies, and cognacs. Visit Georgia with us in the company of chefs, artisans, winemakers, and musicians. Hospitality is a way of life here and every visitor becomes an honored guest. Welcome to Georgia! Your guide will meet you at the airport and you will transfer to your hotel. After rapid check-in and time to freshen up, we'll be waiting for you with a welcome reception in the lobby. The capital city of Georgia, Tbilisi is named for the hot springs which abound in the area and the city truly embodies a more Mediterranean character. Situated along a river and surrounded on three sides by snowcapped mountains, it is the cultural, industrial and social heart of the country and typifies the blend of cultures seen across the country. Synagogues are side by side with mosques and the city is dotted with church spires. We'll see the new Sameba Cathedral which accommodates up to 15,000 worshippers and the 12th century Metekhi Church and hear how it was rescued from the destruction of the Communist purges. The ruins of the 4th century Narikala fortress overlook Tbilisi, and are spectacularly lit up at night. We'll take a cable car up for the incredible views. Walk downtown past the traditional steam baths once favored by the likes of Pushkin, Dumas and Lermontov and discover fashionable Shardeni Street. On our way we will see the 6th century Anchiskhati Church, once the home of the most important icon in Georgia, now housed in the Museum of Fine Arts. 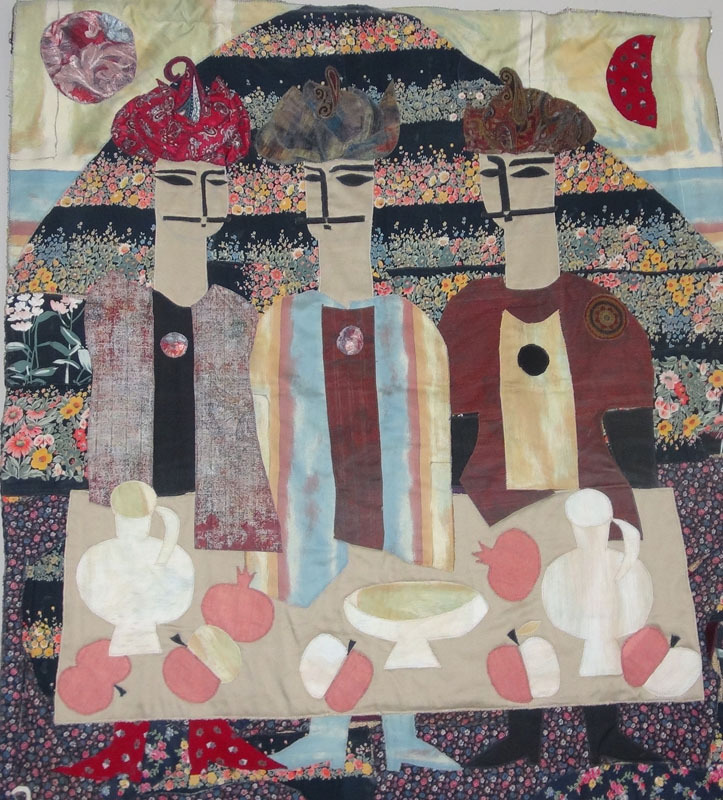 Finally, the tour takes you to the treasures of the Georgian History Museum and Rustaveli Avenue, where the Tbilisi Opera and Ballet Theatre, Rustaveli Theatre, the old Parliament building, and art galleries and cafes create a lively, cosmopolitan atmosphere. Just off the busy thoroughfare is the charming and cozy Prospero's Bookshop and Caliban's Coffee House where we will stop for a coffee break. There is time to relax at the hotel before dinner, and then this evening we will attend a performance of Georgian folk dances. Khaketi is the wine region here in Georgia and everywhere you go you will be offered a glass! Everyone makes their own wine, and our afternoon will include a visit to a local farm to learn more about the traditional, centuries-old methods. 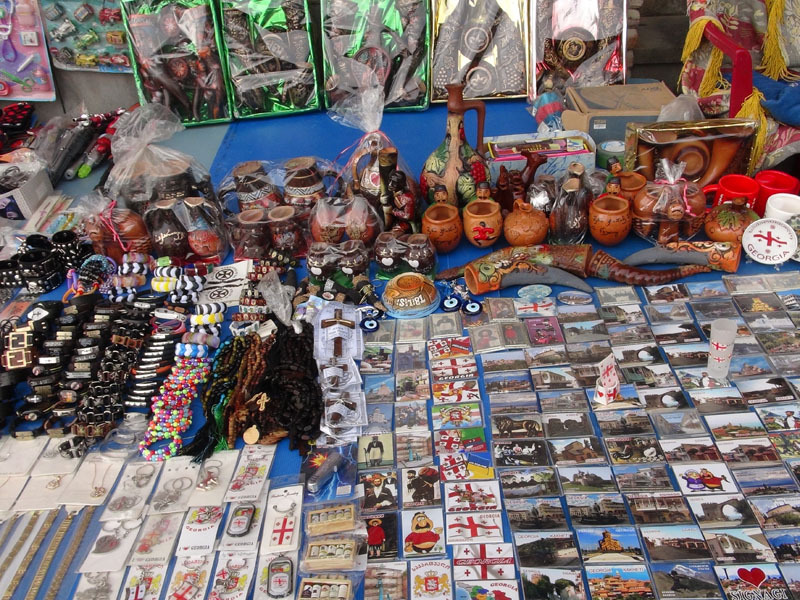 We'll also get a glimpse of Georgian home cooking and sample some specialties. Georgian shoti bread is baked in a clay oven like a traditional Indian tandur. Fresh, hot, and delicious this treat has crisp edges and a soft middle. The oddly sausage-shaped sweet churchkhela is known by many names around the Caucasus regions. Softened nuts or raisins are threaded on a string and dipped into a thick sweet sauce made from concentrated grape or other fruit juices and dried in the sun. No extra sugar is needed for this favorite Georgian treat. 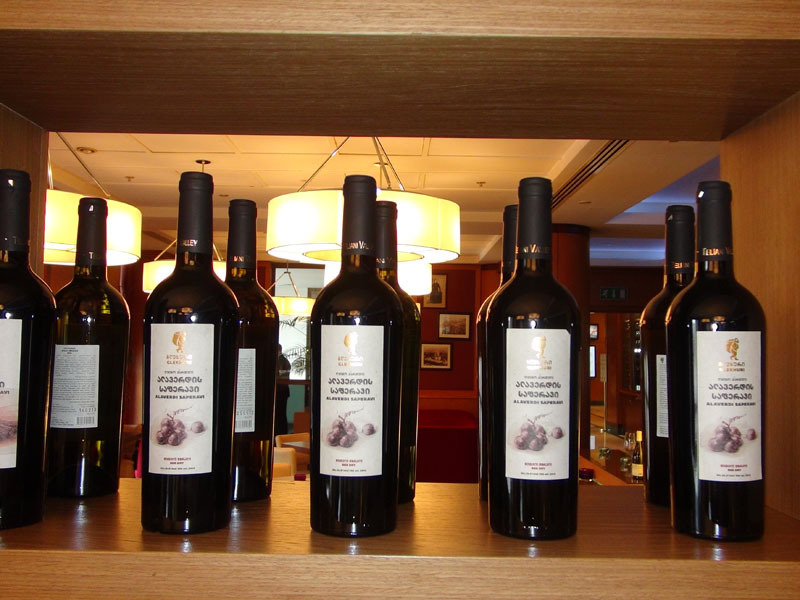 Lunch will be at Schuchmann Wines in Kisiskhevi. Out in the countryside, this large estate has incredible views of the mountains and vineyards from its terrace, with a lovely Georgian menu and an extensive list of its own award-winning wines. Tsinandali is next and the beautiful gardens of the 19th century estate and house museum of the noble Chavchavdze family is the setting for tales of wealth, wine, and kidnapping! After the tour we'll enjoy a coffee break and then head back to Tbilisi over the Gombori Pass. Keep your camera handy for breathtaking views from this pass; often above low-lying clouds here on the Georgian side of the Caucasus Mountains. 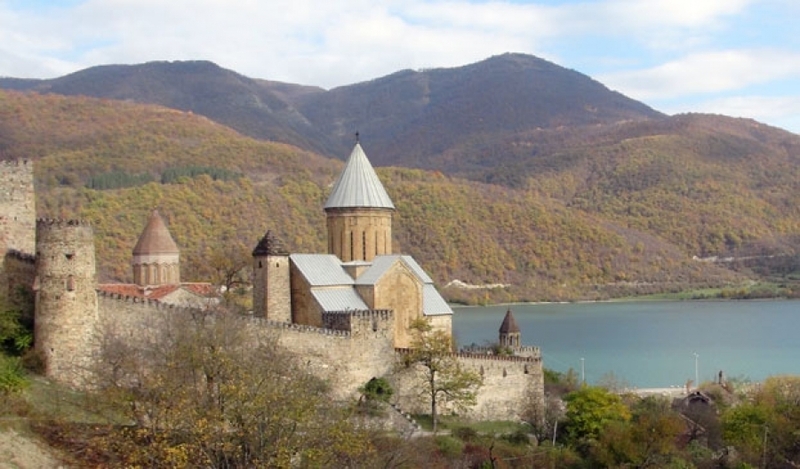 Along the Georgian Military Highway, Ananuri is our first stop today, a complex of towers, churches and crenellated walls above the Aragvi River with views overlooking the Zhinvali reservoir and the surrounding area. 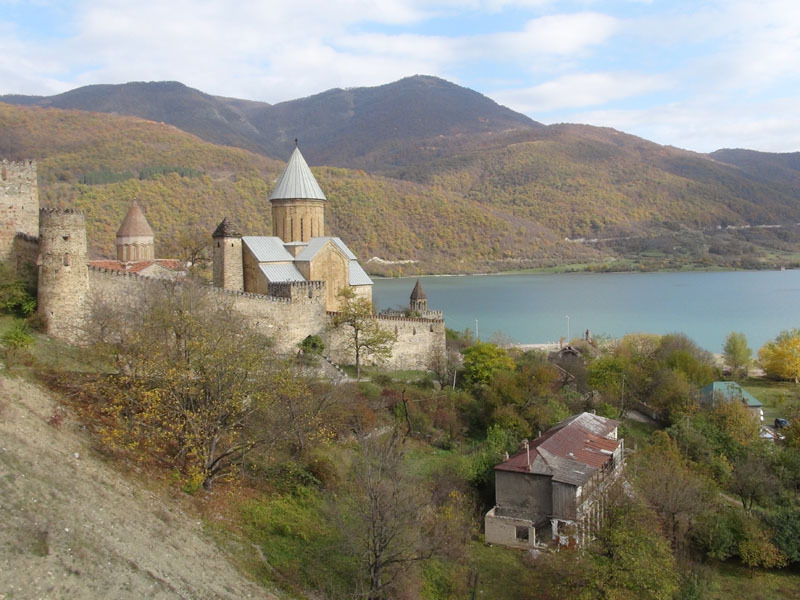 Many of the Dukes of Aragvi who ruled here from the 13th century onward are buried here and the Church of the Assumption is still in use, candles burning below ancient frescoes and the exterior beautifully carved with angels, dragons, and vines. A scenic drive through the Jvari Cross Pass past the popular Gudauri ski resort will bring us almost to the Russian border and the breathtaking village of Kazbegi. If the weather is clear, lunch here will include views of Mount Kazbegi, mythical home of Prometheus and the highest peak in the Caucasus range. 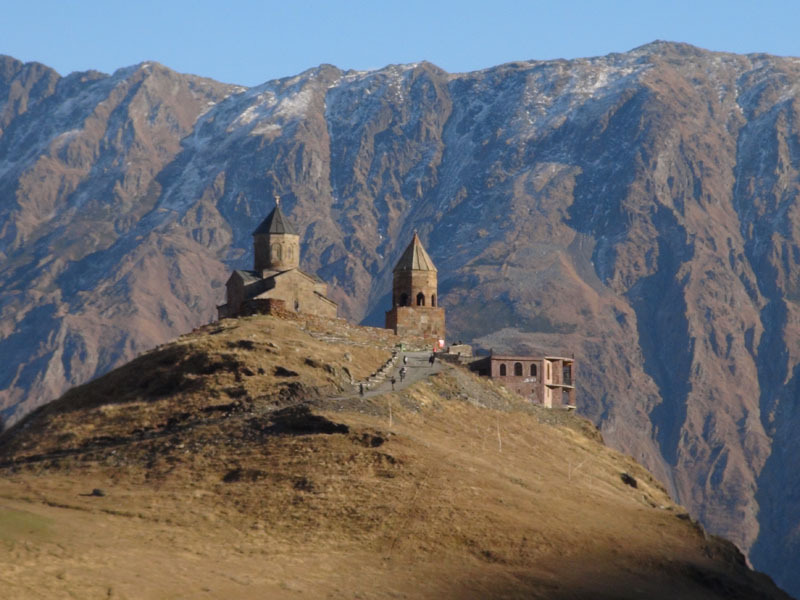 We'll take 4WD vehicles more suited to the terrain through the valleys and up to the 14th century Gergeti Trinity Church, perched high on a hill at 2,170m, and silhouetted against the mountains overlooking the town and the valleys below. Truly these mountains are the heart of Georgia. Driving back, we will enjoy the sights along the road and of course a coffee break on the road back to Tbilisi. Although Tbilisi has been the capital of Georgia for about almost 1500 years, the city of Mtshketa, just to the north, held that honor in ancient times. Situated at the confluence of the Aragvi and Mtkvari Rivers, these were once trading routes along the Silk Road. Still an important cultural and religious center, it is the seat of the Georgian Orthodox church today. 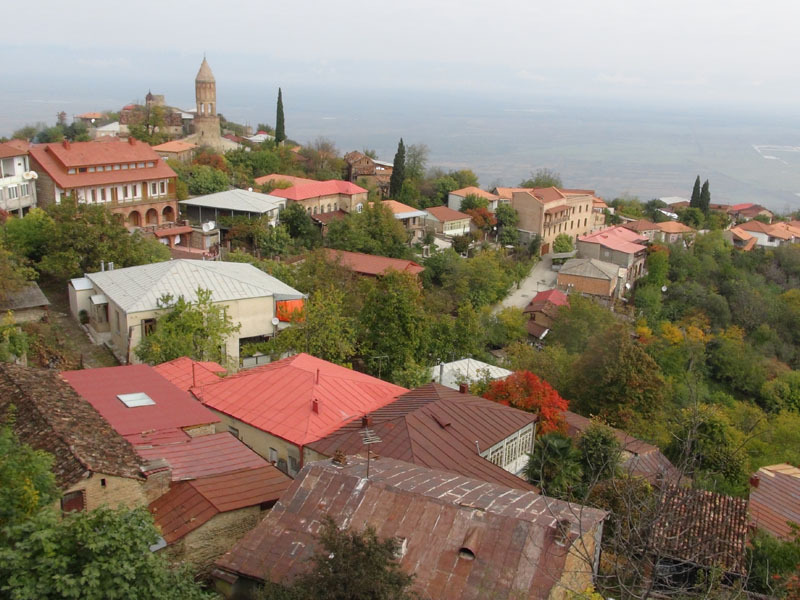 Mtskheta is surrounded by forest-covered mountains, and its historic architecture and charming restaurants give it a quaint, village-like atmosphere. 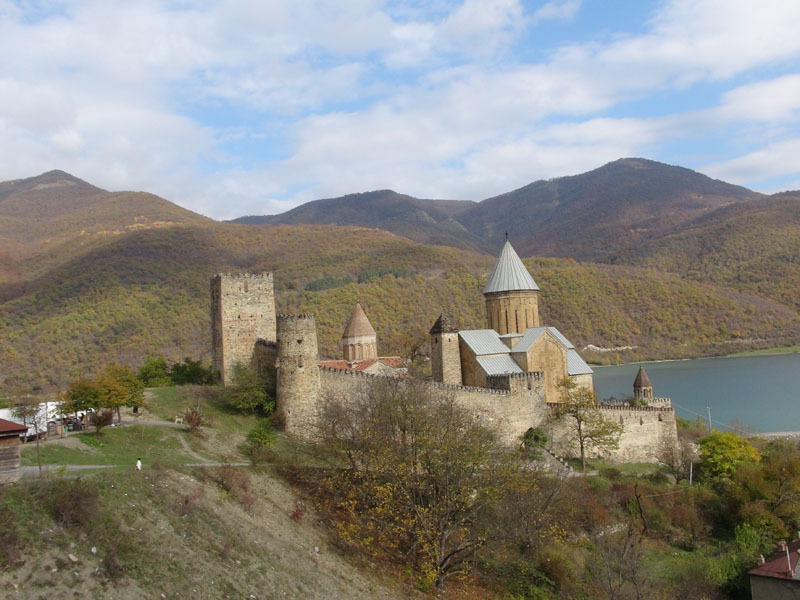 On the agenda first today will be the UNESCO World Heritage sites of the Svetitskhoveli Cathedral and the Jvari Monastery. The Cathedral's origins lie in the holy legends and miracles of Christ's robe and it was the traditional resting place for the kings of Georgia. Damaged over the centuries by earthquakes, Arabs, Persians, Tamerlane and of course the Soviets, it has been restored many times. The Cathedral's interior walls are decorated with icons and surviving pieces of original frescoes, and its baptismal font dates from the 4th century. The 6th century Greek Orthodox Jvari Monastery is perched on a hill overlooking the town. It is said that Saint Nino herself planted a cross in the earth here. There are several buildings in the complex, each reflecting the different architectural styles of their eras. Immortalized by the famous Russian poet Lermontov, the ruins of old Jvari look much the same today as they did when he visited. Nearby is the Tree of Wishes, on which pilgrims and visitors of all kinds fasten their hopes with ribbons. 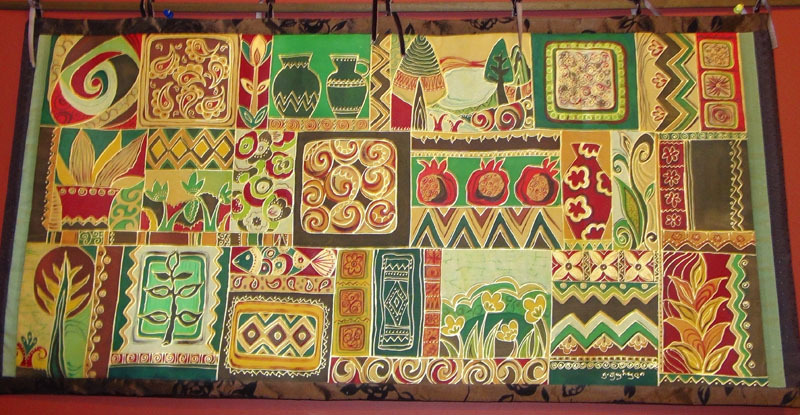 We'll return to Tbilisi and visit a local cloisonné studio to learn about the Georgian enamel making tradition. Dating back to the Byzantine Empire, Georgian cloisonné was well known for artistry and value. After lunch we'll transfer to the airport for departure and hope that your memories of Georgia bring you back again! Delight in the rich variety of Caucasian food from Georgian hachapuri to Turkish kebab! All Ground Transportation in private, climate-controlled vehicles.